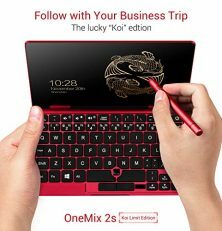 One Netbook OneMix2S Laptop [Koi Limit Edition], Make your laptop special, Design for business, To be your best laptop, during your business trip, Walk with you, work with you, Put your dream & business into your pocket This is a super Mini laptop. You can put it into your pocket, it can put your business into pocket to, walk with you.It likes a working office to work with you in any where. Make your business trip different All in OneMIX, “Man” of steel, OneMix help you to creat business empire, OneMix Aluminium alloy shell was machining by CNC,so we can bring this special metal OneMix to you. 1X 2048Level Original Stylus Pen[Koi Limit Edition] We will only issue 1000 PCS of this Amazing and Beautiful Red [Koi Limit Edition] OneMix2S Pocket laptop.Don’t hesitate.Just one click to own yours! [Tablet/Laptop 2 in 1] Supporting 360-degree YOGA Design,OneMix2S always provides more intimate practical design,360-degree reversal of the shaft design.Notebook mode help you to work effortlessly,leisurely and carefree,tablet mode pursuit entertainment,relaxation. [Powerful Core] Within it’s sleek Unibody Aluminum Alloy Design Shell – Our OneMix2S Yoga Pocket Laptop packs a powerful Intel Core 8th Generation Intel Core M3 – 8100Y Dual Core 1.1GHz, paired with a Intel HD Graphics 615 300GHz Integrated GPU, 8GB of RAM and 512GB of Storage. Having each of its components Actively Cooled by the built-in fan to ensure that every one of them performs as expected. [Unique Design] Support 2048 level Original stylus Pen(the Red Stylus Pen comes with the laptop as a free gift), Fast note, record your idea, make your job faster and easyer, HDMI Output, You can connect the device to high-definition monitor or projector, 360 degree yoga design, More flexible. [Pocket Ultrabook on the go!] 7.0 inches IPS Touch Screen with 1920 x 1200 Resolution, slim body design，OneMix2S is only 1/3 size of a converntional 14 inch notebook, Only 518 g,Easy to Take.